The following is a guest piece submitted by long time Hoboken reformer Kurt Gardiner. Ambition - if there is a word that describes the Hoboken 2017 election that is it. Dawn Zimmer after two terms as Hoboken Mayor decided to move on up and fight global warming. That is ambition. Mike Defusco after only a year and a half as an at times petulant, uninformed and unprofessional City Council person with little name recognition decided to run for Mayor because anything Dawn could do he could do faster without displaying the executive function necessary to do the job. That is ambition. Also taking money from FBW phoney Jim Vance and being against the flood wall after voting for it takes a special brand of person. Bipolar is not just a trendy Arctic sexual preference, it is a state of mind for Defusco. Saying anything to get elected is ambition Cammarano style. Anthony Romano wants to run for two jobs at once. He wants to Stick it to the Hoboken taxpayer twice. Once is not good enough; he wants to screw us in more ways than one. That is ambition Hudson County style. It has been reported that Mike Russo will not run only if his numerous demands are met. Not sure if that is more of a shakedown but that could be a form of ambition. My good neighbor Ravi Bhalla, known more as a Zimmer loyalist than a true reformer bided his time, got the passing of the baton from the dearly departing and before the campaign literature is even dry was out campaigning. That is both a super Sikh political **** block and ambition rolled into one. Karen Nason appeared to run to critique the now departing Mayor. Now that the Mayor is gone, where is the impetus to continue to run? Maybe her only ambition now is to make a point to stay in race to take votes away from Defusco. Jen Giattino may or may not run but will talk it over with family and friends before deciding. It won't just be ambition for her if she decides yes. It will be to continue the reform movement in her opinion. Having a goal to a cause is a form of collective ambition. 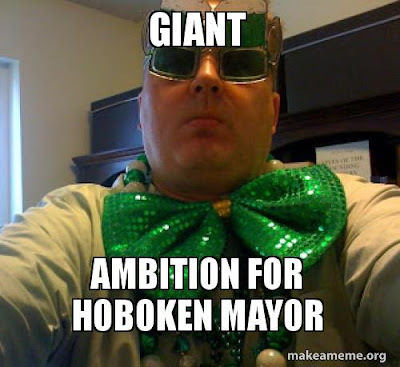 I Kurt Gardiner am a job seeking job seeker and have a limited base and not much money but feel I can add a lot to the continued progress of Hoboken and my platform is simply one word: Ambition. I have more ambition than any of these other candidates so I am throwing my hat in the ring for Hoboken Mayor in 2017. I would announce a slate but they can't handle my ambition. Look forward to seeing you on the campaign trail. I will ambitiously be pursuing your vote, if I don't cut a deal first.